Our ocean is home to a vast array of marine life, ranging from microscopic plankton up to the largest animal on earth, the blue whale. 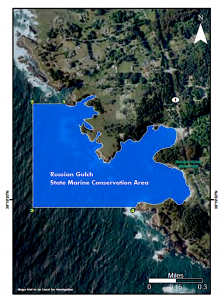 As our understanding of the marine environment has broadened, and as we have seen the degradation and collapse of marine systems around the world, state and federal agencies have responded by protecting special areas of the coastal ocean in order to conserve habitat for this diversity of marine life. Marine protected areas (called MPAs) have existed for many years, as special resources are protected to create more sustainable marine ecosystems, functioning much like parks on land. 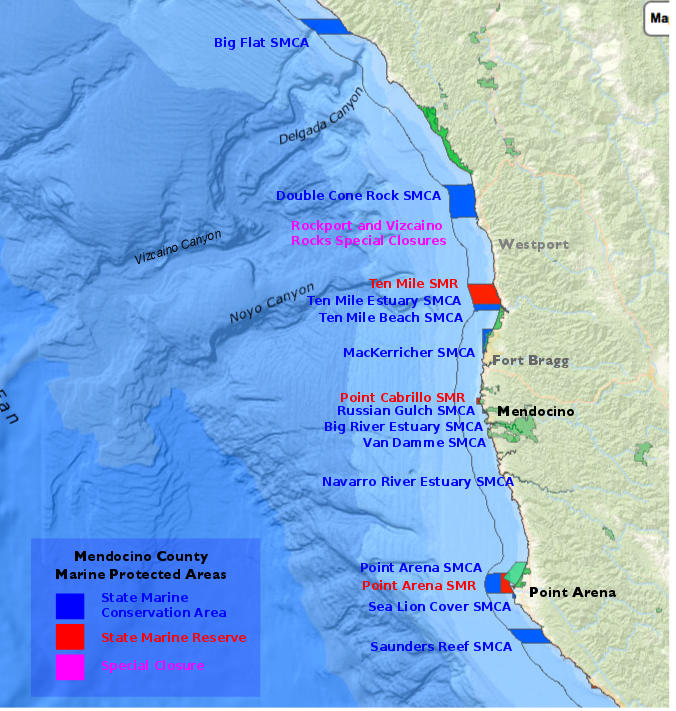 California recently completed a multi-year process to establish an new integrated network of MPAs along its 1100 mile coastline. 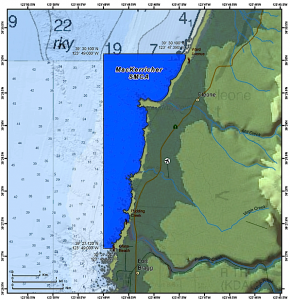 The north coast region’s MPAs were formally established last year. 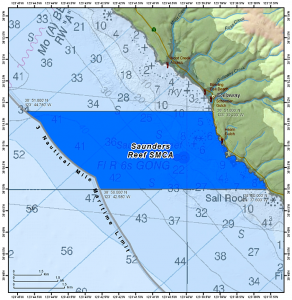 For a complete look at the statewide network, regulations, and the enforcement plan, visit the California Department of Fish and Wildlife’s MPA webpage. 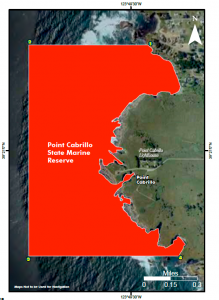 Also, see CDFW’s MPA story by Mary Patyten. 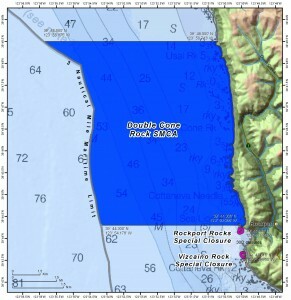 State marine reserve: It is unlawful to injure, damage, take, or possess any living, geological, or cultural marine resource, except under a special permit. 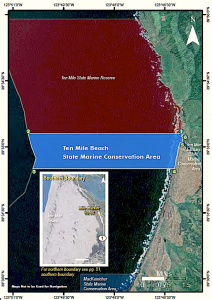 State marine conservation area: It is unlawful to injure, damage, take, or possess any living, geological, or cultural marine resource that has been specifically designated a species of interest, natural community, habitat, or geological features. 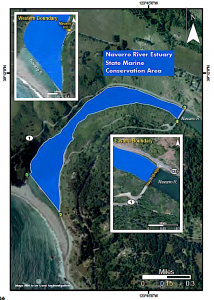 Special closure: Prohibits access or restricts boating activities in waters adjacent to sea bird rookeries or marine mammal haul-out sites. 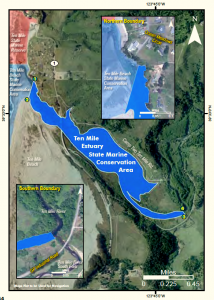 No take except for the recreational take of salmon by trolling and Dungeness crab by trap, hoop net or hand; or commercial take of salmon with troll fishing gear and Dungeness crab by trap. 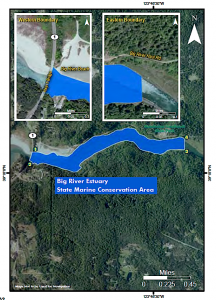 Includes exemptions for some federal tribes. 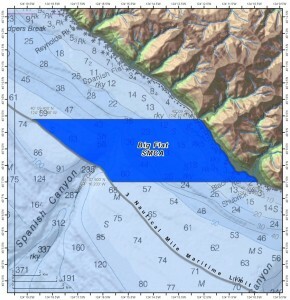 40° 09.400' N. / 124° 12.671' W.
40° 09.400' N. / 124° 19.366' W.
40° 07.500' N. / 124° 16.203' W.
40° 07.500' N. / 124° 10.313' W.
39° 48.500' N. / 123° 50.713' W.
39° 48.500' N. / 123° 55.875' W.
39° 44.300' N. / 123° 54.178' W.
39° 44.300' N. / 123° 50.055' W.
No vessel shall be operated or anchored from the mean high tide line to a distance of 300 ft seaward from the shoreline of the Vizcaino Rocks, and seaward of the mean lower low tideline (in the vicinity of 39° 43.618' N. / 123° 49.950' W) from March 1 to August 31. 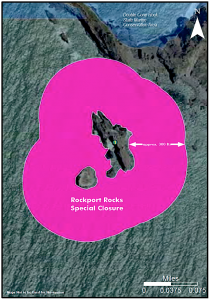 Closed-no take of living marine resources is allowed. 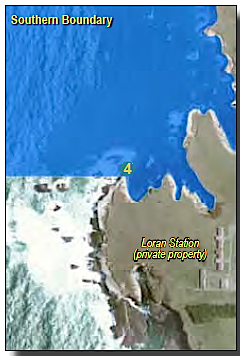 39° 35.900' N. 123° 47.243' W.
39° 35.900' N. 123° 51.479' W.
39° 33.300' N. 123° 50.559' W.
39° 33.300' N. 123° 46.015' W.
The only take allowed is the recreational take of Dungeness crab by trap, hoop net or hand; or commercial take of Dungeness crab by trap. Includes exemptions for some federal tribes. 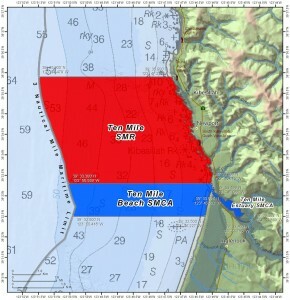 39° 33.300' N. \ 123° 46.015' W.
39° 33.300' N. \ 123° 50.559' W.
39° 32.500' N. \ 123° 50.418' W.
39° 32.500' N. \ 123° 46.227' W.
39° 33.098' N. \ 123° 46.003' W.
39° 33.199' N. lat. 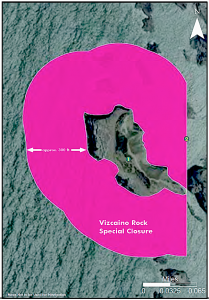 123° 45.966' W.
This area is closed, with exemptions for some tribes. 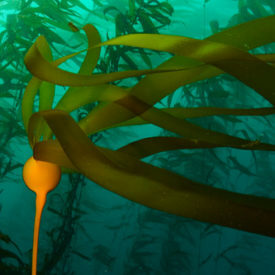 All take is allowed, EXCEPT the commercial take of bull kelp (Nereocystis luetkeana) and giant kelp (Macrocystis pyrifera) is prohibited. 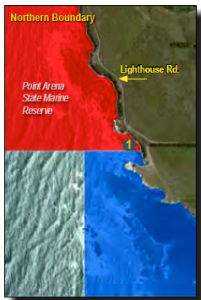 This area is bounded by the mean high tide line and straight lines connecting the following points. 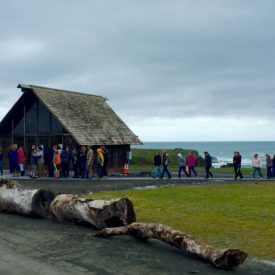 All take is prohibited, EXCEPT the recreational take of surfperch (family Embiotocidae) by hook and line from shore only; and Dungeness crab by hoop net or hand is allowed. No take is allowed EXCEPT the recreational take of salmon by trolling and the commercial take of salmon with troll fishing gear. 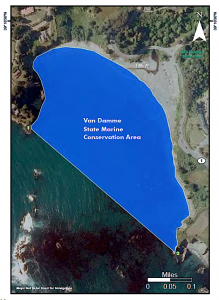 Take is allowed EXCEPT for the recreational and commercial take of all marine invertebrates and marine aquatic plants. Take is prohibited EXCEPT for the recreational take of salmon by trolling, the commercial take of salmon with troll fishing gear, and commercial take of urchin. 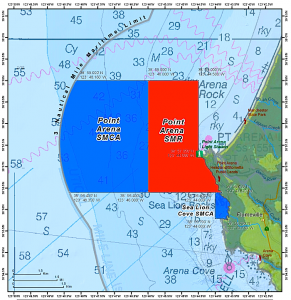 The Ocean Protection Council, in collaboration with the California Ocean Science Trust and UC Sea Grant, is now embarking on 3 years of scientific data collection in our region to establish baseline conditions inside the new MPAs. Check out the projects currently underway. 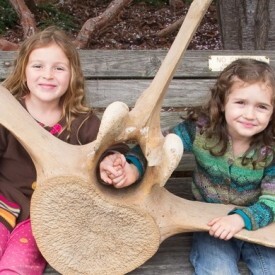 As this science develops, the Noyo Center will bring it to you through talks, workshops, and other events. If you are interested in research partnerships contributing to MPA management and our dynamic connection with the oceans, please contact us.